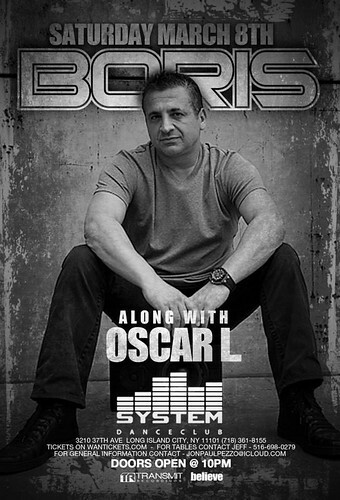 Boris has reigned supreme over every dance floor in the Tri-State area for the last 20 plus years at venues including Pacha NYC, Crobar and Roxy, as well as venues and events around the world, makes his way to Queens for an appearance at SYSTEM Danceclub. Along with Oscar L.
For VIP tables call Jeff @ 516-698-0279. Special 2 bottles for $500 before 1am. All times are GMT -5 hours. The time now is 08:20 AM.